Share the sky with those closest to you. A safe, fun and wildly exciting experience awaits you when you clip into a passenger harness with your tandem pilot. Our pilots are all rated to carry passengers through our organisation (SAHPA) so you can rest assured that you are in safe hands from launch to landing. All of our packages are available in Hartbeespoort, Rustenburg (Gauteng) and Mpumalanga. We know we have an adventure package that will bring a smile to your face! Book an adventure weekend for yourself and your partner. With not one, BUT TWO tandem flights each, at different take-off locations (weather dependant), accommodation options available in the area are not included in the price, but we will happily arrange according to your budget. Day One: ground school and lecture on Principles of Flight. Day Two: Get into the sky and enjoy 3-5 flights depending on the weather. Lunch and accommodation provided at an extra fee. 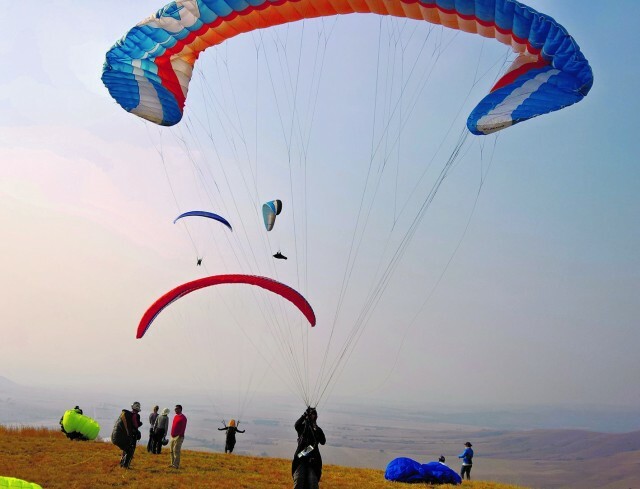 The Introductory fee will be deducted from the full course fee if you decide to continue to full Paragliding license. Friday to Sunday weekender: 3OA (3 Oaks & an Aloe Boutique Guest House) caters to the discerning guest and offers delicious breakfasts and dinners. Relax at the Spa on the premises and be pampered. After breakfast on Saturday morning, proceed to Harties Cableway to meet your tandem pilot for a flight briefing. Depending on the wind direction, either launch north, overlooking Brits – or South, overlooking the picturesque Hartbeespoort dam. Your flight will be along the edge of the Magaliesburg mountain and back again (weather dependant). Should you feel like a bit of cross country flying, your pilot will happily attempt to land at Jasmyn (near Saartjies Neck) where you can enjoy Waffles in true Dutch style. End the day with an enjoyable dinner and evening back at 3OA. Start the day with breakfast at Hero’s restaurant, meet up with your adventure team, Paragliding Pilot and Abseiling Guide. Do both activities and end with a Champagne Picnic Basket before taking the last cable car down for the day. The sky is not the limit, it is the destination! Fly with Attitude4Altitude.